Galas and charity events tend to call for more formal attire. Continue reading our Look of the Week to discover elegant ensembles for such an exquisite night. 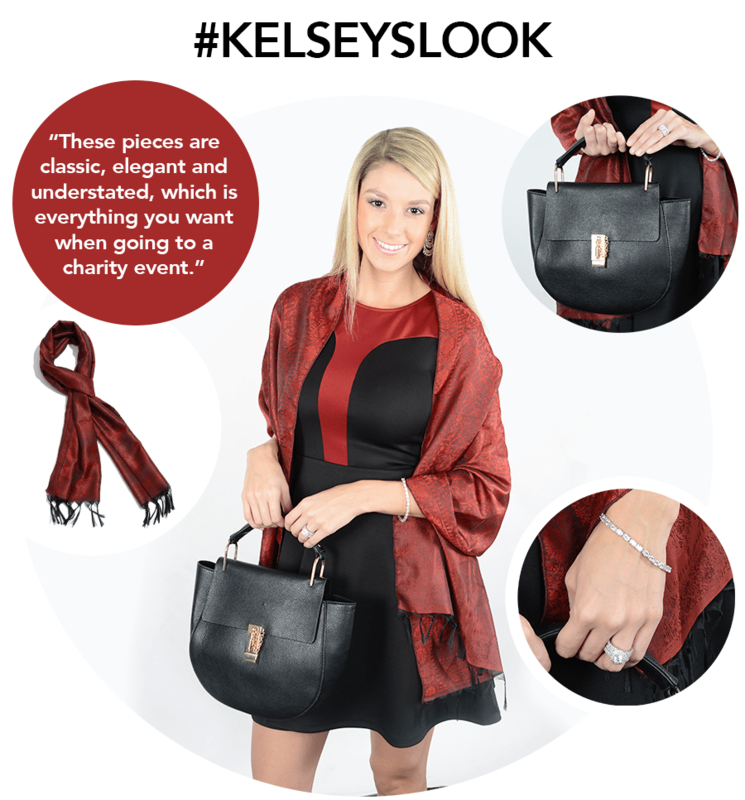 What makes this combination of items perfect for a charity event or a gala? This is the time to shine. I like a bold necklace with rich color, like the shades of blue in this piece. A Bali bracelet works on so many levels to enhance this look. I then finish it off with diamond studs. Have you ever been to a gala or charity event? I’ve attended many of both! I enjoy dressing up and meeting new people, while also supporting a good cause. I love to see what the other ladies are wearing. The necklace is the key to this look. The size of this piece is perfect for the neckline and the colors are rich. It can work as a conversation piece as well as for when you’re meeting new people. Do you have any advice on how to feel comfortable yet confident at a gala or charity event? I think a bold necklace or pair of earrings are the best way to go. They draw attention while adding glamour. Stick to one bold piece to pull everything else together. These pieces are classic, elegant and understated, which is everything you want when going to a charity event. There will be photos taken! I’ve been to a charity event called Eye Care for Kids in Sugar Land, TX. It’s a charity that raises money to buy glasses for children that need them for school. It was a beautiful event with silent and live auctions. Products and services were donated by local companies. I love the bracelet the most! A classic tennis bracelet always works, and the simulated diamonds sparkle in an amazing way. To feel comfortable at a gala, always have a drink in your hand. It can be any drink, but by holding something, you naturally relax and look more approachable. At these types of events you’re mingling the whole time and seeing people you might not have seen in a while. Holding a drink helps you blend in and stay comfortable.